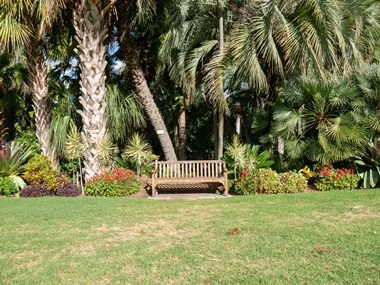 A tropical garden is a garden that features tropical plants. These type of gardens have wonderful scenery and add aesthetic value to any property if done right. To achieve such a garden, one chooses plants with big leaves or dramatic spiky leaves. Lots of shiny-leaved plants add to the tropical look. In such gardens, architectural plants are used in abundance. The dominant overall look is green but patches and pockets of bright dramatic colours are added to complete the design. A tropical garden is packed with plants, one needs to decide which plants they are going to use and plant in groups and use the same plants throughout the garden. To achieve a tropical garden one needs to plan properly. Collect ideas that appeal to you and put them together on one page. Include colours and plants just as you would want them to appear in the garden to get an overall feel of the style you are considering to determine whether all the thoughts can work together. With any backyard theme, the amenities and stylistic references are endless, so you may need help from professionals like landscapers, deck builders, structural engineers among others. Factor such into your plans as advised by professionals from Service Seeking. The beauty of a tropical garden is that it can be created in any climate. Sometimes, even the plants do not have to be totally tropical in nature. They just need to contribute to the feel of a tropical garden. Focus on the foliage. The main feature of the tropical garden is lush and lavish foliage in all shades of green, with a contrast of textures between large-leafed plants, those with long slim fronds and the lacy look of the ferns. Surround yourself with plants. Plant densely, on multiple levels from towering trees to ground cover to plants of varying heights. Use hanging baskets and/or raised beds and elevations to achieve a sense of a cocoon of plant life. Keep the colours vibrant. Flowers and cushions tend toward the hotter colours, bringing to mind the tropical birds that inhabit the rain forests that inspire this look. Bright yellows, orange, red, vibrant pink – these colours provide just the right accent for your tropical garden. Celebrate the water. The abundance of large-leafed plants implies a wealth of water. This is a crucial note in a tropical garden. Even more, the sight, sound, and smell of flowing water is an important feature of a tropical garden. Size really doesn’t matter here – if at all possible, add an element of water to your garden. In tropical garden design, large-leafed plants are very popular. Mostly because they add a lot of drama and are reminiscent of tropical style. In large yards, plants like elephant ears, gunnera, monstera, and philodendrons are a good choice too. Nothing says tropical like monstera, bird of paradise, palm trees and bamboo. There are plenty of varieties for you to choose from, but with so many options. 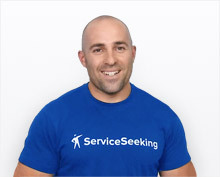 Therefore, to avoid choosing a combination of plants that do not make sense, do reach serviceseeking.com for guidance. A tropical garden is a sensory experience, one needs to add pops of colour in a variety of shapes and hues. One way to do this is by decorating spaces with brightly coloured vines like bougainvillea. Other options include banana plants which can also double up as fruits. It is easy to get plants for tropical gardens. One just needs to do proper research. Tropical garden plants should be flamboyant, lively and colorful, and plants must be chosen on the basis of the size, shape, and texture of their leaves. Planting in groups of odd numbers (three, five, seven and nine) is a common trick employed by garden designers. The idea is to give the garden a broad spectrum of colour and texture and makes a huge difference to the feel of the garden. For maximum impact, position plants with red, yellow, orange, pink, purple and lime-green leaves next to each other. Colourful flowers, such as fragrant frangipani, heavenly hibiscus, ornamental ginger, and dramatic canna lilies will warm up the garden and provide further contrast to the vibrant ground-dwelling foliage and green canopy. 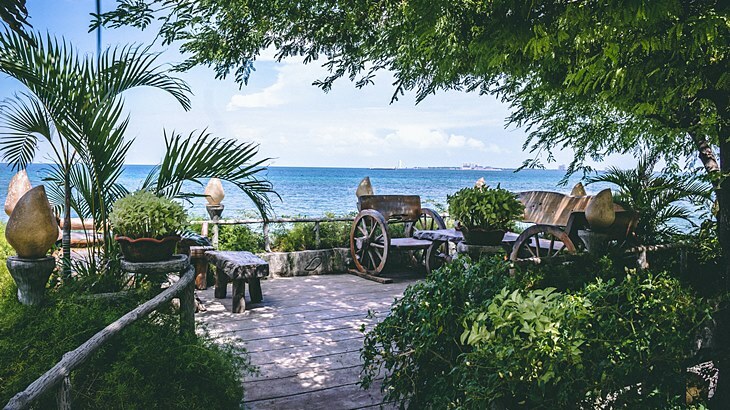 Tropical gardens are inviting, they make one want to cook and eat outside, enjoy breezes, watch sunsets, and just have a cosy feeling of the outdoors. Beautiful timber decking for you to relax on. An outdoor kitchen or bar with a thatched roof which is the perfect place for entertaining guests. Ceiling fans to cool you down if you plan on spending many afternoons and balmy nights outdoors. Warm lighting for ambiance and safety after the sun goes down. You can add solar lighting around paths and garden edges to save money. Comfortable seating with washable water-resistant covers for ultimate comfort when you’re lazing around outside. Use of bright prints and knick-knacks as accent pieces. Use of natural materials such as stone, teak, rattan, linen, seagrass, and bamboo. Consider the use of tropical country inspired statues to add a tropical feel to your space. Use colourful and fun signs to give directions in the yard. The main idea is to beautifully create a tropical welcoming space in the backyard with minimal expenses. When choosing pools or water features for your tropical garden space or backyard, you may want to consider a natural look. One needs to feel like they could be in the rainforest or jungle in your yard. Pools can be surrounded by rocks and water features in between. The idea is to have a lighter coloured pool to get a feel of the watercolours in exotic tropical locations. You can also use ponds. These look beautiful when surrounded by large plants, having water lilies on their surface, sandpits for kids or even tree swings. These make people want to move into the garden. With the above ideas, one can easily have a beautiful tropical garden in their yard regardless of size. The important thing is to know how to care for the garden. How do you care for your tropical garden? Once the tropical garden is done, ensure to give your tropical plants a little TLC to keep them looking their best. Handyman gives four ways of ensuring your tropical garden is well cared for. DIG copious amounts of well-rotted manure or compost into the soil. Organic matter will hold moisture in the soil to keep your large-leafed plants healthy. FEED generously with compost or cow manure in the spring and summer. MULCH around the plants with composted leaves, lucerne hay or pea straw to keep roots cool and retain moisture, topping up as needed. WATER regularly using a hose or install a drip watering system. For more information on creating beautiful tropical gardens, check out Service Seeking. You will be able to reach professional highest-rated landscapers among other experts in your area for high-quality results.